“Rob the Mob” is now playing at Sundance Cinemas. R, 1;44, three stars out of four. From the outside, “Rob the Mob” looks like it’ll be a gritty slice of gangster life. But when you see it’s directed by Raymond De Fellitta, who made some ingratiating Italian-American comedy-dramas in “City Island” and “Two Family House,” you suspect that beneath the gunplay and fuhgettaboutits beats a sentimental heart. The f-bombs are hurled, but lovingly. Sure enough, “Mob” draws no small amount of tension, and a big slice of entertainment, from the seeming incongruity between the tough world it depicts and the often tender souls that inhabit it. De Fellitta almost can’t help but make us feel sympathetic towards his characters; at one point in “Rob the Mob” he crosscuts between the victim of a hit and the mob boss who orders it, and you kinda like both of them somehow. 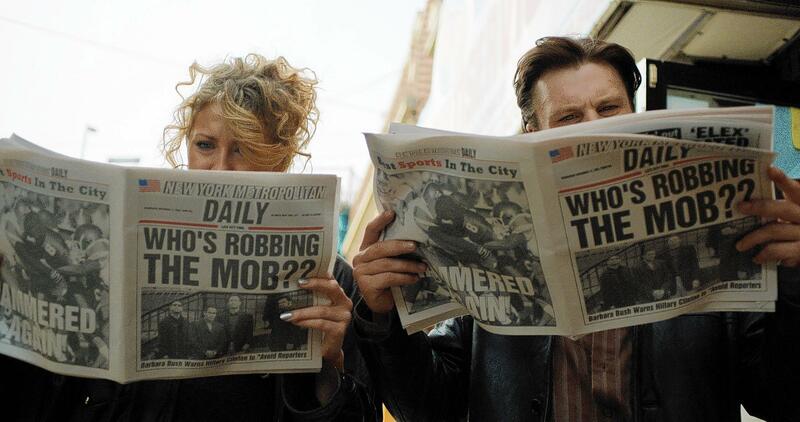 The screenplay by Jonathan Fernandez is based on the real-life exploits of Tommy (Michael Pitt) and Rosie (Nina Arianda), a pair of low-level thieves in the Bronx circa 1991 who can’t even knock over a florist without messing things up. But they’re in love — Rosie even tells Tommy “I love you” as he gets out of the getaway car like she’s dropping him off at the office — and they seem like nice, misdirected, numbskull kids. After a stint in prison, Rosie and Tommy try to go straight by getting a job at a collection agency run by a gregarious ex-con (Griffin Dunne in one of several highly entertaining, slightly outsized performances in the film.) The trial of Mafia boss John Gotti is all over New York TV, and Tommy gets an idea from watching the trial. Why doesn’t he rob the private clubs and other establishments owned by the mob? He learns where the meeting spots are through testimony in the Gotti trial, and he learns that it’s a mob rule that nobody is allowed to carry guns in such clubs, lest there be trouble. Tommy thinks it’s a foolproof plan; he’s the only one in the room with a gun, and afterwards, the mob certainly isn’t going to run to the police for help. In the tradition of get-rich-quick operators everywhere, Tommy has considered every angle of his plan except one. Namely, it’s still the mob. The robberies are played largely for laughs, as Tommy relieves roomful after roomful of “Sopranos” guest stars of their ill-gotten gains. But when the pair inadvertently steal information that could bring the entire organization tumbling down, things get complicated. Not only is mob boss restaurateur Big Al (Andy Garcia, making a straight-up villain role positively poignant) looking for them, but so is the FBI. 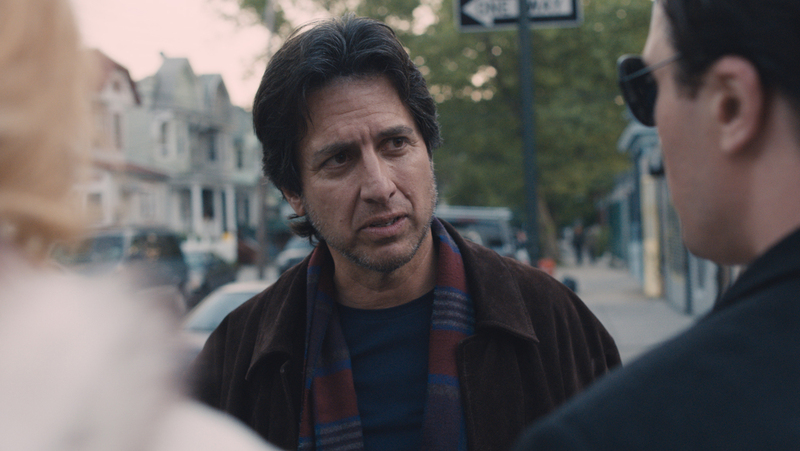 A newspaperman (Ray Romano) wants to tell their story, but headlines aren’t necessarily a good thing. This doesn’t seem like it can end well, and we can see the storm clouds gathering around the besotted couple that they don’t. But De Fellitta treats Rosie and Tommy with such affection that we hope he can protect them. While the world around them is suffused in gray and grime, De Fellitta often bathes the couple in a golden light. Pitt tends to play unlikable characters (“Boardwalk Empire”), but here he’s a charming dolt. And Arianda (“Midnight in Paris”) is marvelous — in another movie, Rosie would be the voice of reason, but she’s just as gung-ho in love and in larceny as Tommy. One way or another, “Rob the Mob” makes sure they go out in a blaze of glory.